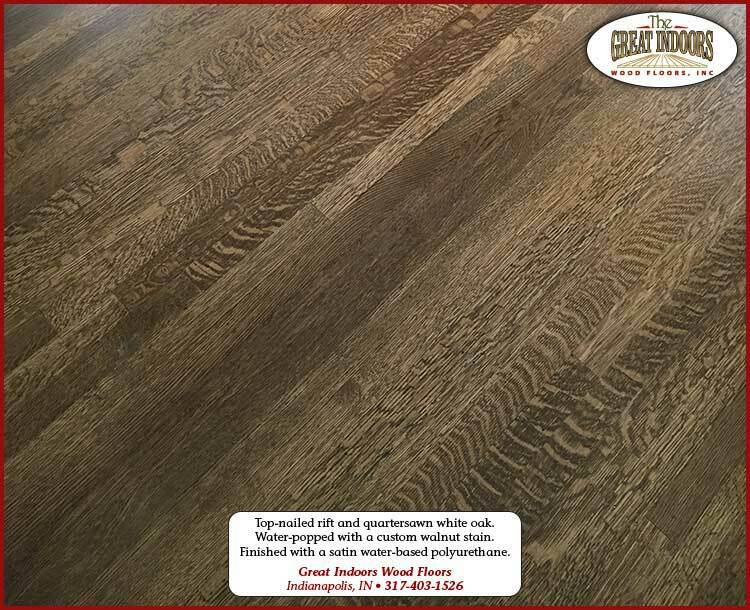 Hardwood floor refinishing company in Indianapolis, IN - sanding wood floors and refinishing the wood by applying a durable polyurethane coating to the wood. 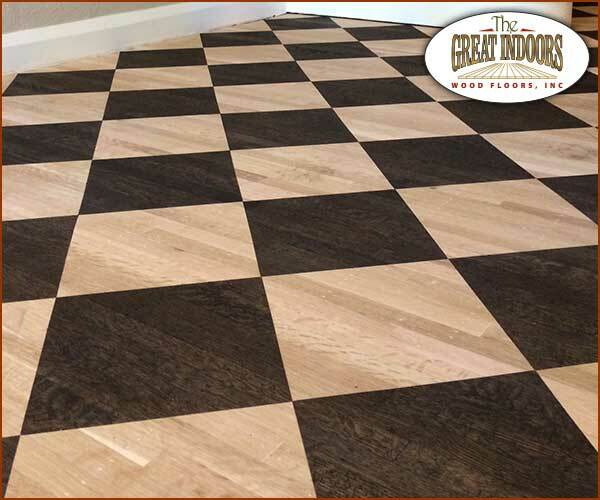 Great Indoors Wood Floors, Inc.
Great Indoors Wood Floors has been refinishing wood floors in the Indianapolis area since 1994. We have refinished thousands of hardwood floors and have an excellent reputation for doing fine work in a timely manner, and being fair and equitable with our customers. We resolve any issues that may arise with customer satisfaction as our goal. Read our customer comments. 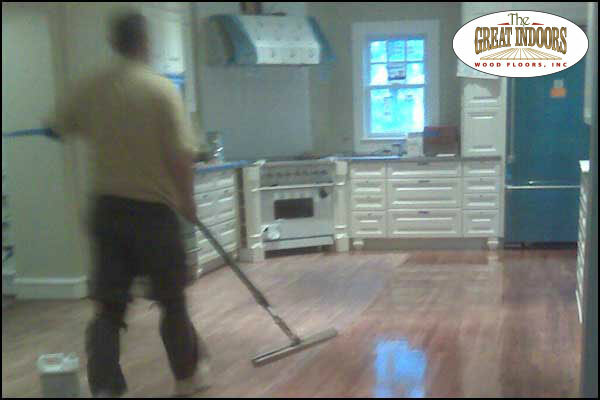 We work hard to make sure that your hardwood floor refinishing project goes smoothly and doesn’t disrupt your life any more than absolutely necessary. 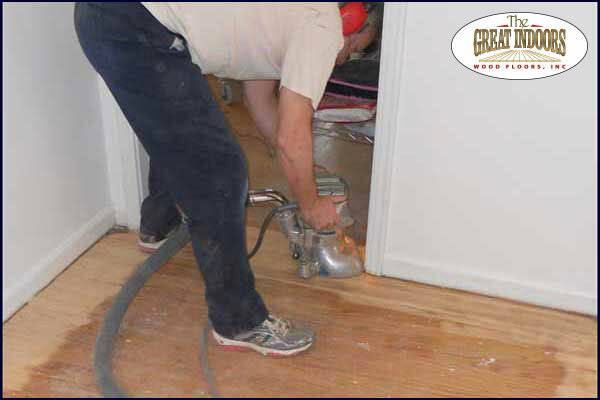 Using a 99% dust-free sanding method, we almost completely eliminate any residual wood dust caused by preparing your floor for refinishing. We generally use water-based finishes that dry quickly and are extremely durable. This allows you to begin using your room(s) again within a maximum of 24 hours after the application of the finish coat. In choosing wood stain colors for your wood floor, we offer many swatches of “off-the-shelf” colors from Duraseal and Minwax. Additionally, we can create custom stain colors using clear bases or white bases for a wide range of hues. We are happy to work with you to choose a stain color that fits your taste. For specialty hardwood floor projects we also offer whitewashing, wire-brushing, hand-scraping, wood inlay mosaics, oil-finished wood floors, and creative staining patterns to enhance the unique beauty of your wood floors. Sand the wood in preparation for the stain. Choose the stain color (if a choice has not already been made or a custom color is requested). Apply the wood stain. Let dry overnight. Occasionally these tasks will run over into a 3rd day depending on the square footage of the job, the necessary repairs to the existing floor, or the amount of time spent choosing stain colors.